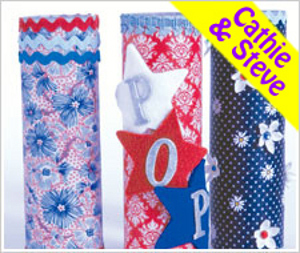 Unlike most craft projects, this 4th of July project from Cathie & Steve is very versatile. When completed you can use it as a tea light, a glow stick, or even a sparkler holder. Your kids will love playing with this craft project on 4th of July, or any summer night. 2772 - FolkArt ® Extreme Glitter™ - Silver, 5 oz. CS11205 - Mod Podge ® Gloss, 4 oz. Measure around the cylinder, add a ½” to the height and width measurements. Trim the fabric to the measurement. Place the fabric on a piece of wax paper and coat with Mod Podge. Wrap the wet fabric around the cylinder, lining up the top with the top edge, wrapping the additional ½” around the base and overlapping the side seam. Place upside down to dry. Once dry, hot glue decorative trim around the top edge. Add extreme glitter to the chipboard letters with a detail paintbrush. Allow to dry. Hot glue the felt stars to the cylinder. Hot glue the glittered letters to spell POP. Optional details: add rows trim along the top or base or hot glue a few simple flowers and rhinestones to the cylinder. For many years our family would have a huge neighborhood party on the 4th with tons of glow sticks for the kids and lights on the trees and candles and sparklers. Wish I would have known about this cool project back in the day, as they say! I think it would be such a fun activity during the day, then to display and put the kids' handiwork to use and display at night! Fun ideas!